Discussion in 'Gear & Equipment Discussion' started by marckfab, Aug 3, 2015. 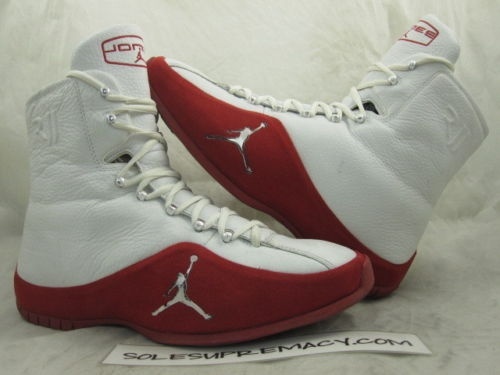 I personally haven't tried these but I do remember reading a thread quite awhile ago with people talking about the Jordon shoes being a bit on the heavy side. These ones are a bit different than the RJJ ones that have the rep for being heavy. The Andre Ward shoes are just rebranded Nike Inflict wrestling shoes. They have a pretty good reputation and I can personally vouch for Nike wrestling shoes. They're very grippy and very light weight. I have the Jordan Olympic Lows and they are one of my favorite shoes for boxing. Lockdown is better than any other boxing shoe made. Period. They are very light, and there is plenty of ankle support. The grip is great on all surfaces and the shoes are very durable. The tongue rolls up into a roll if you wear them really loosely laced, but these really are not for wearing out to the club. Get some Oreo 4's for that. These shoes are meant to be laced up tight and used for boxing. The top part of the back that rests on the achilles tends to rub your ankles if wear low-cut socks, but that is easily remedied by lacing them loose at the top or just wearing higher socks. Ventilation is obviously not as good as all-mesh boxing shoes, so these aren't great to wear with sauna suits. Other than that, though, these look and perform great. but they rubbed out chunks from the front of your ankle, even with socks. I got them at a Nike outlet for $10 and ended up throwing them away (covered in my ankle blood). Those Olympic Lows look prety cool. You think theyd be good for those who have wide feet? And Im sure Jordan would never wear Wolf's......lmao!!!!! I'm more surprised Jordan Brand hasn't made any boxing specific gear, other than footwear, since they've sponsored boxers for such a long time. I would sport some Jordan gloves!! !